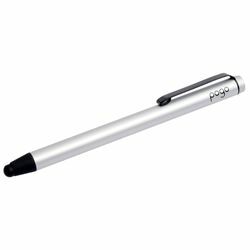 The Pogo stylus is just what you need for writing, painting or signing on your tablet or touch-screen phone. Elegant yet solid, this stylus is pleasant to hold and up for any job. Customize it by unscrewing the end cap and removing the metal clip. Replace the magnetic tips easily by pulling and snapping them off, as needed.